View More In ATV & UTV. 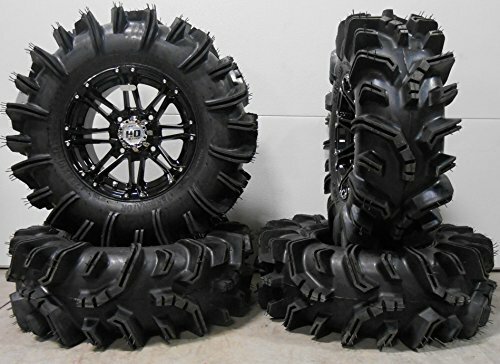 Bundle includes: (4) STI HD3 Gloss Black ATV Wheel 14x7 (4/156) - (4+3) [14HD313] + (4) Super ATV Terminator (6ply) ATV Tire [29.5x10-14] + (1) KJM Chrome Lug Kit & Valve Stems - 3/8" x 24 [Beveled] Tire clearance varies by specific machine. Most machines can go at least 1" larger on the tire diameter. NOTES: If you any questions or concerns about fitment please contact us by email or phone BEFORE you order. Some wheels require a special type of lug nut to fit into the wheel and your stock lug nuts may not work. If you have any questions about this product by Powersports Bundle, contact us by completing and submitting the form below. If you are looking for a specif part number, please include it with your message.